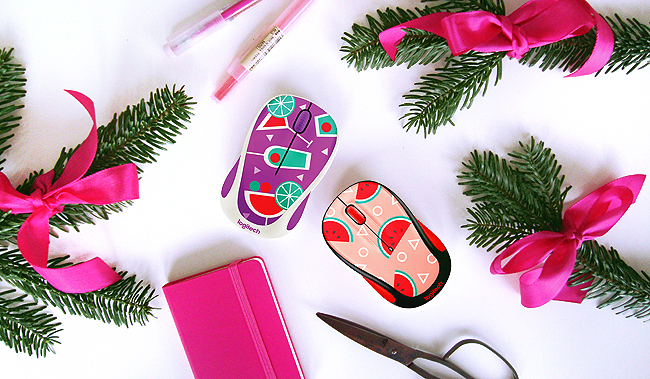 Round three of my Christmas giveaways:-D Today we will have not one, but two lucky winners, each of you getting a Logitech Play mouse in a cool cocktail or melon design. The Logitech Play is a Bluetooth mouse compatible with Mac, Windows and Linux and, therefore, the ideal playmate for every fashionista. Thanks to the scroll wheel you can fly through websites and with very long-lasting batteries (one lasts for up to 12 months) the fun almost never stops. I got my Logitech Play a year ago, and it's the best helper to work on blog posts. Besides, it's functional benefits, it always brightens up my desk and that's what I would like to bring to your home too with this giveaway. Therefore: Good luck! Just follow the options in the Rafflecopter below and let me know if you prefer the melon or the cocktail design. The giveaway is open worldwide and ends on the 2. January 2017. If you mention the secret word hidden in the second image, you can gain an extra entry. The melon design is amazing, and I think the secret word is 'Hoho'. The cocktail design looks good. I love the watermelon one, so cute. The secret word is HOHO. I would love the cocktail one. I would love to have the melon mouse, please! I prefer the melon design. HOHO is the secret word. I like them both but prefer the melon one. I like the watermelon design. I prefer the cocktail design.